Genome-Wide Association Study (GWAS) technology has been a primary method for identifying genetic variants responsible for diseases and other traits for the past 10 years. This eBook explains the fundamental steps and concepts for completing a GWAS and how they're implemented in SVS. 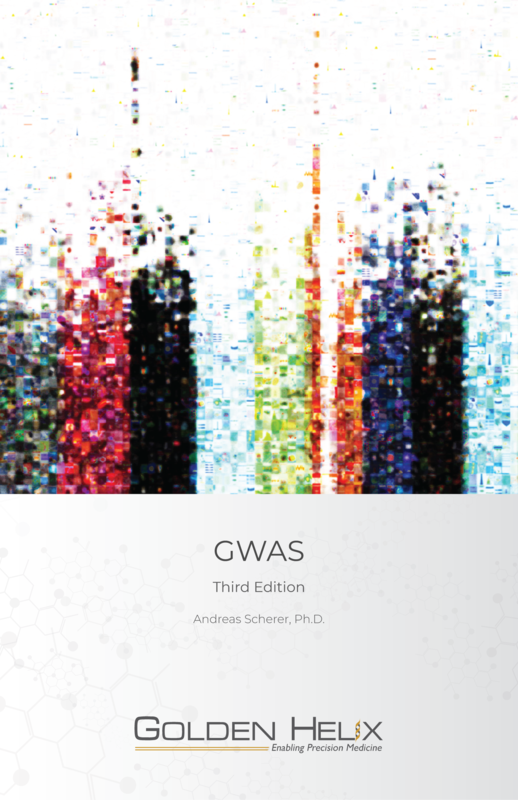 Andreas Scherer, Ph.D. starts with an introduction to GWAS - exploring its biology and origins, as well as the practical use of GWAS. Then, readers get an explanation on how to perform a GWAS in SVS, discussing quality control, including sample statistics, heterozygosity, LD pruning, population stratification and identity by descent. Additionally, this eBook explains how to impute data within SVS. Finally, readers become familiar with genotype association testing and how to conduct a meta-analysis. Fill out the form below and we'll send you a copy of this eBook! Dr. Andreas Scherer is CEO of Golden Helix. The company has been delivering industry leading bioinformatics solutions for the advancement of life science research and translational medicine for over a decade. Its innovative technologies and analytic services empower scientists and healthcare professionals at all levels to derive meaning from the rapidly increasing volumes of genomic data produced from microarrays and next-generation sequencing. With its solutions, hundreds of the world’s top pharmaceutical, biotech and academic research organizations are able to harness the full potential of genomics to identify the cause of disease, improve the efficacy and safety of drugs, develop genomic diagnostics and advance the quest for personalized medicine. Golden Helix products and services have been cited in over 1100 peer-reviewed publications.